Having a solid plan before you begin a landscape project is crucial to success, but unfortunately it is an area widely overlooked in the landscape industry. What is the ultimate goal is the first question anyone should ask before ever buying a plant or picking up a shovel. How will I use the space? What materials do I want? How big will this plant be in 5 years? 10 years? What should I do first, so I don't have to tear out work I already did? At the Green Thumb will set an appointment to come out to your residence, discuss the options with you and draw up a plan of attack for you. We will take measurements and photographs and carefully design a plan that best uses the land and most importantly incorporates your ideas and desires. Listening is one of our better traits. When we complete a project we want you to be happy. We want it to fulfill your vision not ours. Not Good with circles and lines. We understand that Sometimes CAD drawling offer nothing to the customer in helping visualize the final project. So we also offer Digital Design. We can actually take the photos from of house and superimpose the landscape design on top of the picture. 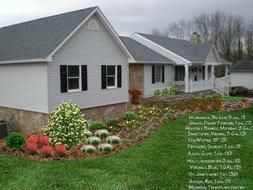 Imagine being able to see your landscape project finished without ever lifting a shovel.